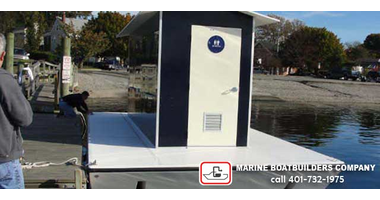 Marine Boatbuilders Company provides Missouri (MO) with custom-made PUMP KLEEN® Floating Restrooms for use in no discharge waters. 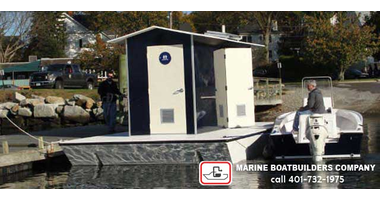 Our ADA Compliant environmentally safe PUMP KLEEN® line of Floating Restrooms are perfect for use in Missouri lakes, inlets, coves and places where there is limited access to bathrooms.. 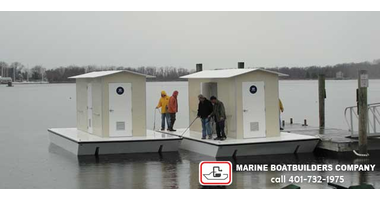 The floating restrooms are built for use in Missouri waters to allow Missouri boaters to pull up alongside the floating restroom and get off their boats to use the facility. 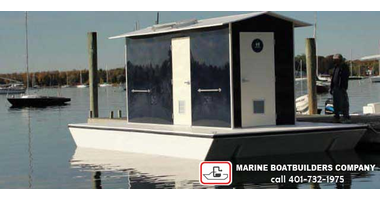 Missouri floating restrooms are designed for ease of use and long-term durability, with low maintenance a consideration. Integrity of the holding tank is a primary goal, even under abusive conditions, such as grounding and other impact. 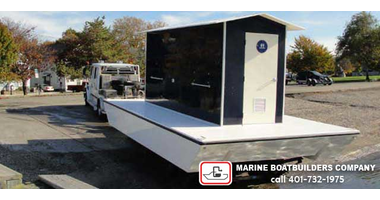 In general, our Missouri floating restrooms are constructed of composite materials, in accordance with standard marine industry practices. Hardware components suitable for a marine environment are fitted for functionality and use. 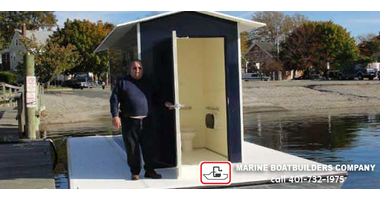 The floating restroom is designed to have one fully compliant unisex restroom meeting ADA Accessibility Guidelines (see below). This includes the fixtures, all internal spaces, external walkways and approaches, railings, door openings, etc. A second, non-ADA restroom is provided. Lastly, a utility/storage unit is included. This will be constructed as a single unit. The design will incorporate a center hull and outer floats. The outer floats are compartmented from the center hull. The initial layer of reinforcement will be laminated with vinyl-ester resin for improved blister resistance. The laminate shall be comprised of gun roving, foam and woven roving. The nominal bottom external skin thickness is 0.26”. The hull is mechanically secured and sealed to the main deck after complete lamination of the holding tank and other structures. The center hull and outer floats are also fitted with internal structure and baffles appropriate to the requirements. The tank will be constructed separately from the external tank shell. The laminate will be comprised of gun roving and woven roving, to a nominal thickness of 0.14”. The tank top will be laminated of gun roving, foam core and woven roving. Nominal thickness is 0.85”. There will be 6 internal, foam cored transverse baffles, laminated in place. A minimum of 2 clean out plates and one inspection hatch will be fitted to the top. The top will be bonded into the external shell. The tank will have a 2” PVC pipe at the center of the holding tank. This will be used for tank pump-out. The cavity between the tank and the outer shell will be 2” PCF foam. The tank capacity is 1000 gallons. 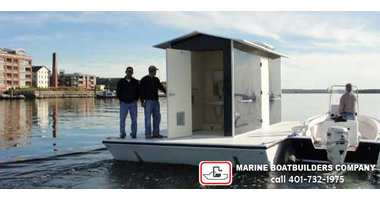 The floating restroom deck will have a non-skid gelcoat surface and will be laminated from gun roving, foam core and woven roving. Nominal thickness will be 1.21”. The deck will have a downward turning perimeter flange of sufficient width for fitting a rub rail and corner bumpers. Extra laminate is provided in the flange for durability. The deck will be secured to the hull with a “shoe box” style joint, covered with a heavy-duty rub rail. 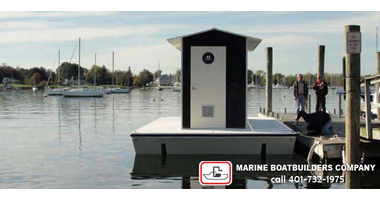 The floating restroom house is designed with three compartments. The large compartment is an ADA compliant unisex restroom (see compliance section), and houses the restroom fixtures. The second compartment is the utility room and houses electrical components, pump-out connections, provides supply storage, etc. This space is not ADA compliant. The third compartment is a non-ADA restroom, and houses the restroom fixtures. Space is allowed for a shower stall (optional). The house is laminated with gelcoat inside and out, gun roving and foam core. The nominal thickness is 0.68”. FRP, gel coated, self-closing doors are fitted at to each compartment. Doors have standard locks, and louvered vents. The restroom doors are a minimum width of 34”. 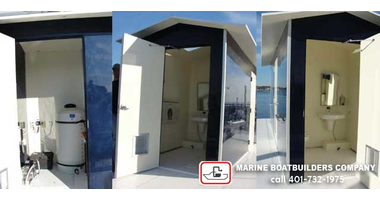 The floating restroom roof is laminated with gelcoat, gun roving, foam core and woven roving to a thickness of approximately 0.68””. The roof provides overhangs on the ends for some protection from the elements. The roof is peaked with a slope in accordance with standard building criteria for snow load. The restroom compartments contain a toilet and sink. A pressure water pump and expansion tank will be provided in the utility room. City or marina water connection will be provided in the utility room. All piping will be fitted with heater tape to prevent freezing. The toilet and sink discharge directly into the holding tank, which is vented to the roof. The floor drains directly into the holding tank. 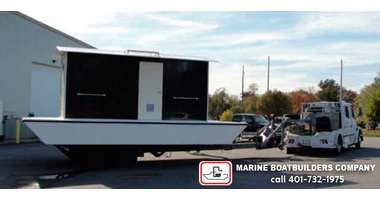 A 30-amp 110/120VAC electrical system will be provided, including a connection (in the utility room) to the marina shore power. Interior lighting to be appropriate to facility use. Exterior courtesy lighting for walkway illumination to be provided. Doorway lights at each door. A system will be provided to ballast the hull wing sections with water, in four separate compartments. The purpose of the ballasting system is two fold. 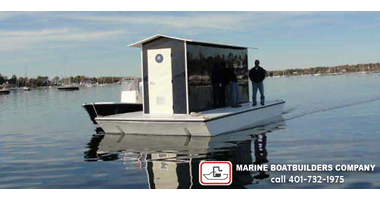 The unit is designed with 20” of freeboard in the light ship condition. 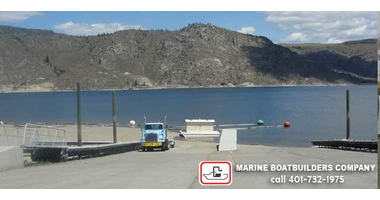 The ballast system will allow the unit to be “sunk” to existing floating dock freeboards of 17” to 20”. The second purpose is to allow the unit to be “trimmed” both longitudinally and transversely to accommodate non-symmetrical weight distribution. 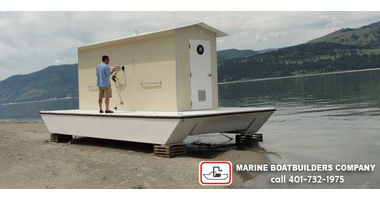 The Float Ballast System (FBS) is trademarked and patent pending. The facility is designed with shore access from the “long” side of the deck. The unit will have water access on the opposite side via an 20’ nominal opening between the railings The perimeter railings are designed with a bottom rail, flush to the deck, which provides the required retainer lip for ADA compliance. Additionally, there is a hand rail all around the house. Five year structural warranty, for all fiberglass components. One year warranty on all factory installed hardware and other components. 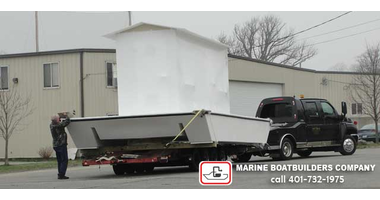 All warranty claims must be made in writing to Marine Boatbuilders Company, by the owner or legal owner’s representative. Repair work undertaken without prior written approval of Marine Boatbuilders Company, may not be eligible for reimbursement. 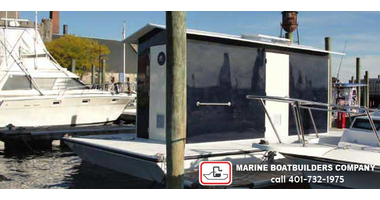 Marine Boatbuilders reserves the right to repair or replace at its own discretion. Transportation costs associated with repair work are the responsibility of the owner. 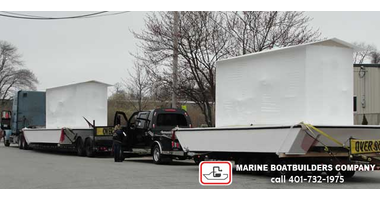 In the event of warranty work required located outside of the New England area, Marine Boatbuilders Company agrees to arrange and supervise the requisite work with a local sub contractor, or send a representative to perform the work. Extended warranty - extensions to the standard warranty are available. Custom Colors - A variety of colors are available. Section 4.1 Minimum Requirements-meet or exceed for single wheel chair. Pumpout Boat Sepcifications Subject To Change Without Notice. 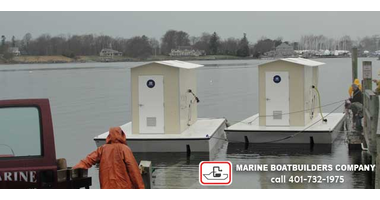 Contact Marine Boatbuilders for a Floating Restroom estimate 401-732-1975 Click here to complete our online quote request form.